A GAP (Guaranteed Asset Protection) Waiver is a contractual, non-insurance, agreement which provides for the waiver (or cancellation) of the borrower’s debt in the event of a total loss or unrecovered theft of a vehicle as set out in the agreement. The borrower’s primary insurance carrier will determine the actual cash value (ACV) (market value) of the vehicle at the time of a loss. Under most insurance contracts ACV is the amount the insurance carrier is required to pay, even if the amount owed to the creditor is more. The difference between the ACV and the balance owed on the debt is the consumer’s “gap” that still remains to be paid to the creditor. 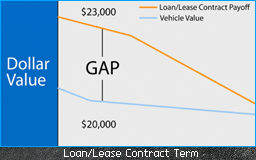 A “gap” usually occurs when the value of the vehicle declines faster than the amortization of the debt secured by the vehicle. The GAP Waiver cancels this “gap” for the borrower and may also include the borrower’s primary insurance deductible. GAP Waivers benefit both consumers and creditors alike. Since GAP Waivers extinguish the remaining debt, consumers benefit by not having to make continued loan payments on a vehicle they either cannot drive or cannot be located. Further, consumers are more readily able to get their next vehicle with the higher likelihood of stronger equity in the loan (if applicable), since they do not carry over negative equity from the prior loan. Lastly, GAP Waivers help provide consumers with peace of mind, knowing they won’t have to worry about a “gap” later in the loan, should it arise. Creditors benefit by mitigating loan risk (from canceling the “gap” portion of the debt), enhancing relationships with borrowers (since they don’t have to ask for payment on a totaled/stolen vehicle) and they earn income from sales to consumers. GAP Waivers are purchased by consumers who are either concerned that they do not have the ability to pay off the balance of a loan if there is “gap” after the total loss of a vehicle, or they simply don’t want to worry about a “gap” should it occur. A GAP Waiver is a product offered to a consumer by an automobile dealership, or directly by a financial institution or other auto lender, in conjunction with the financing of the purchase of a vehicle. Federal Regulations permit GAP Waivers for federally chartered financial institutions. Many states have passed laws allowing GAP waivers for state chartered financial institutions and other lenders that are not subject to the federal parity requirements. An extension of credit cannot be conditioned upon the purchase of a GAP Waiver. The purchase of a GAP Waiver must be optional and voluntary. Many states regulate the product and require specific disclosures to the consumer of the terms of the GAP Waiver. In additional, state and federal laws require disclosure on the finance contract of the purchase and cost of the GAP Waiver.